There are 4 main types of destructive termites that termite companies must treat for in Mesa, AZ. They are Desert Subterranean termites, Western dry wood termites, Arid-land subterranean termites, and Desert dampwood termites. But for our termite company in Mesa we find that we treat the most for the desert subterranean termite. What is the most common termite in Mesa, AZ? Desert Subterranean termites are the most common of these terrible little creatures that our termite company in Mesa, AZ treats for. They live mostly in the Colorado and Gila deserts of Southern Arizona around Mesa, AZ. They live on desert plants including dead cactus but can severely damage the structure of buildings, utility poles and other such timber structures. These termite can be identified by their pale yellowish brown body and an indistinct or absent fontanel (front gland pore). The swarmers are about 3/8″ long including their wings where they have two prominent hardened veins in the front and the wing membrane is almost translucent with only a few hairs visible. Their front wings are larger than their hind wings. The Desert Subterranean termite soldiers have long powerful pointed jaws that are slender and slightly curved inward at the tip. The small size of these termites and their ability to forage under dry conditions allows them to occupy a very special niche in the subterranean termite world. What do Desert Subterranean termites in Mesa, AZ feed on and what are the signs you may have them? Because these termites are not as dependent on moisture and decay as others of their species are they will readily attack dry, sound wood and a typical sign of infestation is the presence of “drop tubes” coming from the ceiling rafters and sheet rock/plasterboard in your Mesa, AZ home. They also prefer to forage in shaded soil or areas made wet by irrigation where they will construct mud shelter tubes up, and over or around solid objects in order to reach a timber food source. These tubes are usually slender, solidly built and pale yellow or tan in color. A well developed mature colony may contain more than 300,000 termites and can have a foraging area of almost an acre. They only require a tiny gap of about 1/32″, in concrete flooring or mortar joints in brick walls to gain access to the wall, roofing or other structural timbers in a building in your home. We here at Varsity Termite are an expert Termite company in Mesa, AZ that specializes in treating for these destructive desert subterranean termites. Contact us today for more information! Our team of expert exterminators will be happy to help you with any questions or concerns you may have. 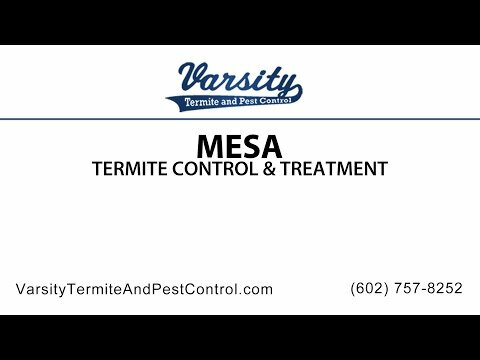 If you are looking for a profession exterminator for termites in Mesa, contact Varsity Termite and Pest Control today! Also explore our website and blogs to gain knowledge in pests, scorpions, and termites. To see how to prevent termite damage around your home read more on our blog.